This article presents argument is support of two related claims. The first claim is that there is a significant probability that the supposed “Ebola outbreak” in the United States is, at least so far, fraudulent. The second claim is that the overriding political purpose of the putatively manufactured mass Ebola paranoia in the United States is martial in nature. That is, the second claim comprehends the notion that deep state neocon figures are attempting to pressure the fraud Obama into aggressive military action in places such as Syria and Iraq, and conceivably the Ukraine. A contrived Ebola mass panic that has the potential to easily, and instantly, transform into a reality—even a derivative reality that at bottom is false—is an ideal mechanism by which to exert maximum pressure on Obama. The argument is presented as follows. First, reasons in support of the claim that the Ebola outbreak in America is, at least so far, fraudulent are offered. Having established that there are good reasons to consider the fraud hypothesis valid, predictions derived from the hypothesis are offered. Obviously, to the degree that the predictions are substantiated/disconfirmed in coming days, the probability assigned to the fraud hypothesis should be increased/decreased. The conclusion specifically includes an assessment of the way in which Ebola’s apparently “aerosolized” status fits into the discussion. There are at least two sets of probabilistic reasons to suspect Ebola fraud in the United States. These two sets were canvassed in an earlier article by this author that appears here. First, and briefly, while the MSM has reported with tremendous enthusiasm Dr. Kent Brantly’s plasma transfusion matches with three U.S. citizens tightly connected to U.S. soil (Dr. Nick Sacra, NBC cameraman Ashoka Mukpo, and Nurse Nina Pham), the probability of these matches having actually arisen is provably, and formally so, exceedingly low (either .0352 or .0036 depending on whether Brantly’s blood type is A or B; as the above-linked article demonstrates, O and AB can be ruled out by logical deduction). We might add now that, should the set of three be pronounced fully recovered, we would, in principle, have to factor in the likelihood that the plasma transfusions worked—after, of course, having accounted for the probability of having recovered anyway, how soon treatment was administered, etc. While data might not be sufficient to allow us to quantify this, we would nonetheless be compelled to acknowledge that logically speaking, a “three person recovery” result could only revise the already low probability estimates even further downward. Second, there is, at least as of this writing, really no persuasive evidence that Nurse Pham (or, as far as I am aware, Amber Joy Vinson, for that matter) has Ebola. This is not a bombastic claim; instead, it is predicated on the way rational inference with probabilities works. We’ve been told that Pham received a positive Ebola diagnosis. However, we still know next to nothing as to exactly what her exposure to Duncan consisted in, and how long she was exposed. On the basis of what we have been told so far, it is quite possible that her prior probability of having contracted the disease was very low, which, together with the reality of false positive tests, might even mean that she is still more likely not to have Ebola than have it—in spite of the positive test result. And here we arrive at a most interesting topic of discussion in connection with the MSM that should be discussed before moving to analysis of some contextual reasons to suspect Ebola fraud in the United States. Readers might agree that this point could be even more significant than others made in this article—particularly since it might shed light on mass-mediated fraud generally speaking. It is highly doubtful that the MSM did any assessment of the prior probability of Pham’s having contracted Ebola before reporting that she had it and making Pham an international figure. And how likely do you think it is that an Axis U.S. Government official tapped an MSM mouthpiece on the shoulder and began talking about the importance of prior probabilities? Suppose now that someone were to whisper in the MSM’s ear that Pham doesn’t have Ebola, but rather something else that mimics Ebola. Do you think the MSM/Government Axis would reverse course? This writer, at least, doesn’t think so—and these considerations show that the MSM/Government Axis is, even under the most charitable of interpretations, gambling with respect to Pham’s status. It is obvious, though, that with enough such gambles, sooner or later entirely fictitious realities will have been constructed—fictitious “realities” that are very unlikely to be unwound even if they were innocently (if recklessly) created in the first place and are only subsequently discovered. Here are some additional, and rather more contextual, reasons to suspect fraud with respect to Ebola in the United States. we now have, as Zero Hedge indicates, a U.S. federal figure, clipboard in hand, who traipses after purported U.S. soil generated Ebola victim # 2 Amber Joy Vinson. The federal figure, of course, is sans protective regalia. This explanation, of course, is so preposterous that to dispute it would be undignified. And then there are the silly “self-monitoring” programs that have been set up; how effective at containment are those supposed to be? Plus, we have Obama’s designation of Ron Klain as Ebola “czar”—a know-nothing from the standpoint of medicine but a political fixer extraordinaire. Also, there is the issue of travel bans, which Obama refuses to enact. If Ebola really is much more contagious now than it’s ever been and presents a serious threat to the United States, with 150 or so travelers a day coming from West African nations and not merely the possibility, but the likelihood that, given enough persons and flights, someone would be transmissible (even if not obviously so) on a plane, even Obama would enact a travel ban—unless he is trying to destroy the planet with Ebola (which is possible, but very unlikely to this author). Readers will undoubtedly be able to extend these sorts of observations, but here it perhaps suffices to note that while incompetence could conceivably explain the observations in the previous paragraph, incompetence doesn’t explain the Brantly transfusion compatibilities and doesn’t eliminate the Pham prior probability issue. And, isn’t “incompetence” an uncomfortably common explanation of nearly every national security-related lapse? If the current Ebola cases in the United States are in fact fraudulent, what conclusions should we draw regarding future events? One question, to be sure, is whether Obama knows they are fraudulent. On this score, it is reasonable to conclude that nearly everything the Obama administration has done is fully consistent with their believing that the cases are fraudulent. It might even be reasonable to say, as suggested above, that the behavior of the Administration can be construed as an admission that fraud is in play. But if it is fraud, and Obama knows it, he also knows that saying so in this atmosphere would likely lead to his removal from office. He also knows that Ebola in the United States can probably be made real anytime the people faking it want to, and so the fakers have the upper hand in every way that matters. But what do the fakers want? Likely, the same thing they’ve wanted for a very long time: aggressive, militarized action in the Middle East and against Russian interests. Under this view, the statistically unprecedented White House fence-jumpings and Secret Service lapses didn’t work; “Khorasan” and “Boko Haram” didn’t work in terms of compelling stronger militaristic interventionism. Nothing else has either. So the solution has been to compel Obama to stake his presidency on an Ebola situation that has likely been serving other purposes in Africa anyway. So, Obama, having not heeded the Secret Service failure message or any other message, either offers a pronounced intensification of interventionism abroad followed by a drying up, and “containment” of Ebola in the United States (hail to the “chief” after all); or he refuses—in which case, more “Ebola” cases pop up sooner rather than later if at all—very possibly including one that is real. It is also quite possible that Obama will be given additional justification for intervention by way of manufactured noise in areas such as the Middle East—just in case the Ebola grease isn’t enough. In the meantime, immediately ensuing days may well be more or less quiet on the Ebola front; after all, the still somewhat useful fraud Obama will be given enough time to cut the “right” deal. To be sure, readers might find themselves wondering: “why Ebola as the mechanism”? There are several good reasons as to why this might be so. First, unlike terrorist attacks with, for example, bombs, the Ebola threat is continuous in nature and therefore in principle allows for more time for negotiation and greater ambiguity as to appropriate response. Second, it amounts to the sort of bioterror which is much more difficult to attribute to “failures” of the national security apparatus than it is to Obama in his civilian capacity. Third, what other form of fraud can produce a higher yield in terms of disruption? What other form of fraud offers Ebola’s sort of combination of mass-mediated sympathy and fear, and hence large amount of mass-mediated contagion per “casualty”? In principle, while people vary greatly in terms of fear responses, those who don’t worry about bombs might well worry about sneezes and vomiting—especially if told to do so. Fourth, there is obviously the result of funneling even more money into Big Pharma, and the prospects of looming mass vaccination programs and an even greater Fascist takeover of health care. Fifth, the Ebola potentiality generates fascinating political unifications. Many critics of the NWO from the “left” and the “right” have been galvanized, and suspect that the Ebola state of affairs might an NWO end-stage move. Perhaps, but wouldn’t it be ironic if misguided paranoia assisted in the implementation of major mid-term moves advancing global fascism by giving technological and economic control a bit more time to develop? Overall, it is very rarely the case that the collection of interests that generates mass frauds does so with only one goal in mind. If the current Ebola situation in the United States really is fraudulent, it likely serves many functions, and in all likelihood was never intended to be “unleashed” in the United States until the public psyche had been appropriately conditioned by months of news reports. Now to the conclusion, which, as promised at the outset, includes reflection on the “aerosolized” issue from the standpoint of the fraud hypothesis. Ebola may well be airborne, and there is reason to believe that the current strain or strains of Ebola we are dealing with is/are novel (click here for a discussion of each possibility). It cannot be gainsaid that there is empirical data in support of these propositions, and it should be noted here that Brosseau and Jones, as well, have suggested that Ebola may be airborne. And yet, this does not necessarily detract from the probabilistic assessments, suggestive of fraud, regarding the Brantly transfusions and the Pham/Vinson prior probability concerns. It should be noted that Brosseau and Jones do not so much as rule aerosolized transmission in as show why it ought not be ruled out. This is not a criticism. Instead, it is a way of indicating that we can’t be exactly sure of what the viral capabilities are at present. If the fraud hypothesis is true, the novel strains of Ebola might well already be aerosolized, but right now the better bet is that the aerosolized possibility is being used as a propaganda tool and that reports of increased fatalities are either exaggerated, or outright lies, or real but attributable to other considerations involving human parties. The author’s primary reason for modifying his earlier conclusions on the “aerosolized” possibility emanates from the probabilistic indications of fraud. Obviously, empirical evidence in the future might counsel rejection of the fraud hypothesis. Regardless, this author hopes to discuss, in a future contribution, just how easy it is to generate mass frauds. 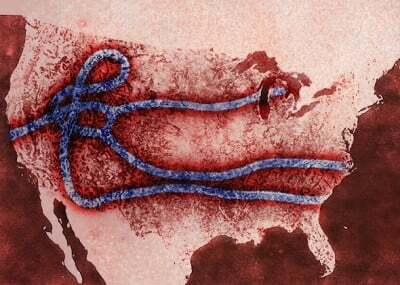 In closing, though, it is important to acknowledge that the Ebola situation in the United States could be real, and could easily become real even if it hasn’t been so far. If it is real, though, there is no reason to expect cases to suddenly go quiet on weekends, is there—particularly with some many persons supposedly exposed?